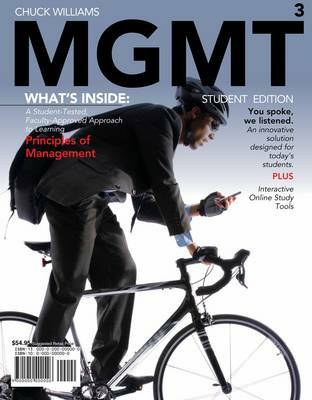 Student-tested and faculty-approved, "MGMT" is an innovative approach to teaching principles of management. This paperback includes a suite of learning aids to accommodate the busy and diverse lifestyles of today's learners, including downloadable flash cards, videos, MP3 review podcasts, and quick quizzes that allow students to study wherever they are and whenever they have time. Designed to reach today's students, "MGMT" says it all in four letters, reflecting how this unique solution speaks in the language of today's learner. "MGMT" started with student conversations, focus groups, interviews, surveys, and input from nearly 150 faculty members like you. This innovative approach unites research with author Chuck Williams' unique storytelling approach in a visually rich, yet professional design that reads like a business periodical. "MGMT" provides a streamlined, concepts-driven format with optional exercises, cases, and applications found in the supplement package, which you can choose to use depending on your students' needs. Choose "MGMT" for the unique principles of management solution that you and your students have created together.